As soon as I lowered my camera he took off, landed on a thick limb of a hemlock, and serenaded me with his honking-scolding. I would like to believe that the nuthatch read my post and liked it so much he decided to pose for me. Otherwise, the best explanation I can come up with is that he hit his head on the feeder as he landed and was temporarily stunned until the click of my camera awakened him. Or maybe he was wondering what he did to deserve big, nearly-hairless bipeds feeding him free food for fun and and decided he better make with a pose, and quick, before the biped with the weird, clicky-flashy, black box took the food. Whatever his reason I sure appreciate the result! She’s beautiful–and so is the hemlock shot! I love when the Nuthatch sits still like that! 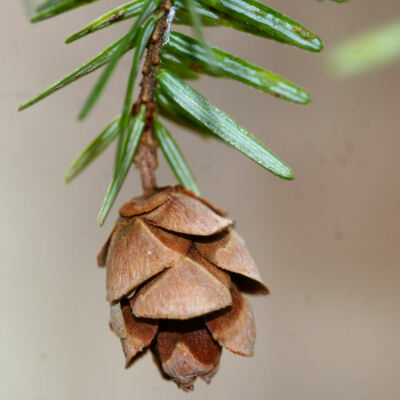 Also love your hemlock shot! You guys have to stop, I swear he was still blushing this evening! 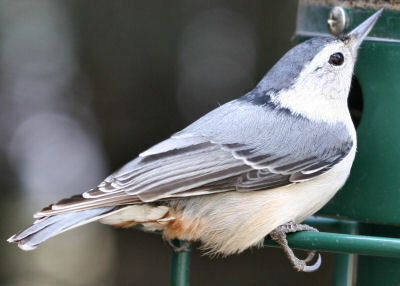 Thanks for the picture because one nuthatch much like your own found it’s way to our home feeder and we couldn’t decide what it was until we saw your pic. Thanks!